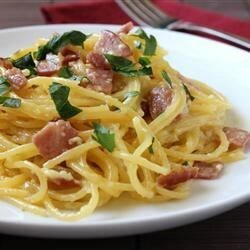 Crispy bacon and sauteed onions and garlic are tossed with cooked spaghetti, beaten eggs and a generous measure of Parmesan cheese. The heat from the pan and the hot pasta will cook the eggs and melt the cheese. Garnish with parsley and extra cheese.